Want a Mercedes 600? Have a Fiero? You're in luck! If you've ever dreamed of owning a serious German V12 coupe, but your circumstances have left you driving a Fiero, here's your big chance to trade up! 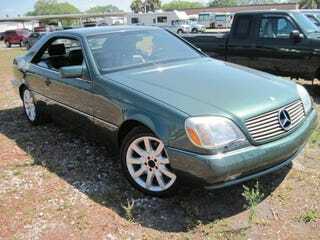 The current owner of this classic Mercedes 600SEC is looking to make an even trade on a Fiero. This may seem like a huge step down, but the guy had an epiphany, or as he put it: "Just had a dream where I was cruising in a swapped fiero just moments ago and like they say, follow your dreams." So who can really argue with that? He's pretty detailed about what the car has had done and what it needs, and it seems to be decent enough (evaporator and suspension have both been dealt with, which is huge for these cars, plus a new set of MB OEM 18" wheels), and the things that still need fixing aren't mind-blowing either. So if your dream was to swap your crappy Fiero on a twelve-cylinder luxury autobahn machine, this is probably your only chance. Carpe diem!